It was just after dusk at Carrot Field's farm, a modest place just out past the rolling hills of Sweet Apple Acres, and away from Ponyville. Here, the gray earth pony with his ruddy mane was just finishing packing the usual provisions into his saddlebags for his oft trips out to a large hill to observe the night sky through his telescope. It was his favorite hobby, a passion that even exceeded his affinity for farming the land. Blankets, check; star charts, check; Astronomical Astronomers Almanac to all things Astronomy, check; quill and ink, check; and of course, the most important part, strapped to his back, his large telescope. It was a typical outing, except for one large difference. This time he was meeting another pony up at the hill, an stunningly beautiful pink pegasus named Bolt he just met earlier that day. He had never actually hung out with another pony before while stargazing, let alone a radiant filly. It was almost like ... like it was a date or something. Nay, he thought to himself, she couldnae possibly ken tae it bein' a date, roit? Those nagging doubts were interspaced with what his hopeful thought that just maybe ... maybe it was indeed a date. Of course Carrot didn't tell his sister, Purple Haze, this - he simply told her he was again looking at the stars as usual. Hopefully she didn't notice the goofy grin that he couldn't really hide. Ã‚Â Hopefully she didn't notice the blush in his cheeks. In any case, he wouldn't have to answer any questions when he got back - she should be snug in bed by then. Carrot approached the summit of the large hill just as the last light of the evening twilight was fading and the stars were starting to shine in their full glory. The hill was large and open, giving a full panoramic view of the sky as long as it was clear, which it was save for a few stray clouds. It would seem the other filly he met that day, Rainbow Dash, kept her promise. He would have to somehow repay her. As he set up, Carrot couldn't help but look around, not at the stars, but instead for any sign of the filly whom he'd invited. Nothing yet, but he could feel the butterflies grow in number and intensity in his stomach. Why did he have to be so nervous!? Stargazing was his favorite pastime! It didn't take too long for him to finish setting up, a large blanket to sit on in front of the telescope, not one but two extra thick blankets it case it got cold, all his stargazing charts and books - it was perfect, except that there was still no Bolt. Maybe she isnae coming after all ... Nuts and Shoes Carrot, ye probably weirded her out with yer enthusiasm. Who are ye kiddin' anyway? Why would somepony that stunning want tae hang out with ye? Carrot sighed, the self-doubt had crept in. No, no, no. It was still early. She might just be on her way. It's not like she was even late yet. Oh, geez, what if she didn't show? Not that this was unusual for Carrot. He did that a lot. But usually, he just went out back and looked at the stars, with the telescope set up in the barn. That was good enough for him. Tonight, instead, he was going to the stargazing hill, as he called it, which he usually only did for special occasions ... but there were none, tonight! And then he blushed when he said he was heading out! He never blushed about going star gazing... And then, when he was packing supplies, he packed *two* blankets! Usually, he only packed the one! Purple Haze was sure. The only thing that got her big brother all blushy was a filly. He was going stargazing with a filly! Big Brother Carrot had a date! *eeeeeee! * How romantic! So she nodded as he told her to do her homework - she would! Eventually... and she pretended to do as he said... She brushed out her orange and purple mane, and her green coat, as if the little earth filly were getting ready for bed. And then, when he left, she slipped out and followed afterwards! Well, he didn't have to worry. He didn't know it, but he had a guardian angel named Purple Haze, coming along to make sure this was the best night ever! Bolt had no idea what to do with herself, she usually wasn't the type to worry about what she looked like but today she was nervous. In the few hours before she was going to meet up with Carrot she kept playing with her hair in the mirror every time she walked past it, even though that wasn't doing much to change how it looked. As usual her mane was a little wild and stuck out in a few spots, being a weather pony made it hard for her mane to not get super messy. She was always pushing around clouds or dealing with wind, when that kind of stuff is going on it's pointless to worry about how your mane looks. She still wasn't sure if Carrot had actually asked her out on a date or just wanted to hang out with her. She was really hoping it was a date and based on Dash's teasing she was pretty sure she was right but Bolt wasn't confident enough to completely accept that assumption. Right before Bolt flew out the door she pulled a little box out of her dresser and opened it carefully. Inside was a delicate chain necklace that had a little cloud pendant dangling from it. She didn't wear it often but it was her favorite necklace. Her parents got it for her right after she got her cutie mark and told them she wanted to be a weather pony just like them. She adjusted it carefully so that the cloud pendant was centered and messed with her hair a little bit more. Once she was satisfied she walked out her front door and looked down at ponyville, it was so pretty right before sunset. There wasn't a cloud in the sky as Bolt flew towards the hill Carrot told her to meet him at. Guess Dash kept her word about keeping the sky clear tonight, even though this part of Ponyville was scheduled for light cloud cover. Tempest definitely would not be happy with the unscheduled weather change. Bolt couldn't help but smirk when thinking about Tempest complaining to Dash about it and Dash playing like she had no idea what Tempest was being so stuffy about. As Bolt approached the hill she started getting nervous about the whole situation again. Was this a date? she had no idea. What if it was a date and she wasn't acting interested enough? or if it wasn't and Carrot thought she was acting weird? she tried to tuck away her nervous thoughts so she could focus on her landing. Bolt thought it would be funny to do something a little show offy so she maintained her speed until the very last second right before landing. Unfortunately she forgot that that little trick always messed up her hair. Her nerves were starting to get to her but she had to say something! She gave Carrot a shy little smile "Hey... I hope I'm not late"
As he was debating that thought he didn't catch at first the blazing pink streak barreling down on him. He looked up and suddenly - there was Bolt, zooming down to him with great speed, looking as if she would plow right into him. Carrot wasn't sure what to do - part of him wanted to bolt out of the way, but part of him was just in awe. When she suddenly stopped and landed right in front of him, his astonishment only grew. Maybe it was the moon light, maybe it was his secret hopes he wasn't quite yet ready to admit about the this being a date, but watching her softly land, with her colorful purple and blue mane flowing wildly from her entrance, and her necklace briefly floating and glinting in the dim light, just made his heart skip just a beat. Oh horse feathers, was he blushing already? It took a few seconds, a few impossibly long, awkward seconds, for him to regain his composure. "Oh, nay, nay! Ye're nay late, nay a'tall!" He gave a reassuring smile, trying to at least look a little charming. "Ach aye, that was a bonnie landing ye just made, just bonnie. Er. Bonnie flying Oi mean! Bonnie both! Were you in th' Junior Speedsters Flight Academy?" Even Carrot knew about that school for Pegasi, where the fastest Pegasus colts and fillies honed their flying skills. It certainly didn't hurt to complement her so right away, even if it wasn't some sort of official date. With that compliment, he decided to show off the telescope, as be backed up slightly to turn to it, he rather clumsily tripped over his back two hooves and landed on his duff right next to the telescope itself, nearly knocking it over. Ach, ye clumsy git!, he thought to himself. He tried to rescue it with a quick smile and gesture. "And here ye'll see th' telescope! ", he blushed with a wide, embarrassed smile. Purple Haze waited impatiently. She knew she was right - she'd seen her brother set up for a night of stargazing before, and he was way too nervous, and kept looking around like he was expecting someone. Oooo, who was she? Purple Haze wondered if she'd met her yet. Then she dropped out of the sky, like a bolt of lightning. Ahhhh, she was so pretty! And Purple stifled a giggle. She shouldn't have been surprised that it was a pegasus. Carrot always had thought wings were pretty. But when she got there, Carrot didn't give her flowers, or treats, or anything! He fumbled and stammered and fell over himself! *sigh* Ach, big Brae, ye fergit th' most basic things! Aye, ye'll be th' derth of me, yet. It was a good thing she was here! Well, enough flowers everywhere! She grinned to herself and hurried off into the woods, picking out only the loveliest violet and pink flowers that would match the pegasus filly's colors. She was sure that Carrot would manage for at least a couple minutes before she got back! Bolt couldn't help but notice the bright red blush that spread across Carrot's cheeks as she landed in front of him. She was feeling like such a dork, she wanted to know for sure if this was a date or not but she felt way too silly to ask. It was starting to feel like one considering how nervous he was acting and how nervous she felt. Although she was trying so hard to stay cool she couldn't help but blush and smile when he smiled at her, he was just so cute and sweet! He tripped over his words a little as he complimented her flying, and that just made her blush even more, she could feel her cheeks burning bright red now. "Thanks" she said a little shyly "I was! but only for a few summers... She kind of trailed off, not sure what else to say about it. Bolt couldn't help it, she was trying not to act weird but she just felt shy and dorky. Something about this pony just made her nervous, but in a good way. He was so nice but he was shy and she just didn't want to look like a nerd. Before Bolt could say anything else, Carrot tripped as he tried to walk backwards "ohmygosh are you ok?" she said quickly. she hovered only a few inches off the ground over to where he was now sitting in the grass and offered him a hoof, she couldn't help but giggle a little at his goofy smile. "That looks like the nicest telescope I've ever seen" at this point she couldn't even tell if she was blushing or not but she didn't care anymore. Carrot Fields just rubbed the back of his head with his hoof and snickered at his own clumsiness as she gave an awkward but friendly smile. Even though he felt very embarrassed by his inept first impression, he was determined not to mess this up further by getting downhearted about it. C'mon Carrot, me lad, ye kin still make a good impression on her! Faith and begorrah she is ever so bonnie in th' moonlight! Should Oi tell her that?. Carrot reached out and took the hoof that Bolt held out for him, giggling. Unlike most such filly snickerings, this one was disarming, somehow warm. Despite her laughing at him, it just made him feel a little more at ease. For the first time, he understood what they meant about 'laughing with'. Carrot quickly drew himself to his hooves, "Ach, jus' a little fall is all ... Oi ... must have missed a rock or something, Oi'm fine" he blushed. "So ... you were in fer only a few summers? That move was amazing, Oi guess yer just that good naturally! If they've a Wonderbolt junior program, yer should really try out fer it, Oi'm sure ye'd get in!" Alright, that make have been a little thick, Carrot thought. Nervousness, that's all. It was true, though. "So, this be th' telescope! An' Oi already said that! Thankee, though, Oi'm glad ye loik it!" He grinned. "Oi already have moi favorite constellation in th' sky, Orion! He was a great earth pony who hunted monasters in th' Everfree Forest! Ye kin see the three stars on his belt, an' he fought with no more'n a stick in his mouth! But he was also boastful, an' arrogant, an' was brought low by a tiny scorpion's sting, because of his ego! That's woi he's opposite Scorpius, fleein' each night under th' horizon, as Scorpius chases him 'cross th' sky!" He grinned a bit proudly for having gotten that all out without stumbling, but was so worried... what if she thought he was a nerd? He didn't want to look like a big nerd in front of her! "So, ah ... did ye have yer own story an' name fer somthin' near that?" Purple Haze rolled her eyes to herself, listening to her big brae bletherin' on about th' stars. She dinnae know why he was so fascinated with stars, when carrots were down here on the ground! She doubted there was even a carrot cons... constile... consolation! But she supposed that pegasus fillies must find it more interesting, or at least this one. She hoped. Maybe she was as much of a nerd as Carrot was! She laid down the developing bouquet, considering it... she added a few leaves. Yeah, that's the ticket! And a little curly vine! And one nice white little flower to set off all the pinks and purples! Yeah! She pondered it thoughtfully. That'd do! she gathered them up and carried them back to the hill, peering up and waiting for *just* the right time... there, they were both turning towards the telescope! Carefully, she snuck up the hill, crouching low to the ground. Light as walkin' between the carrot rows! She slipped up *right* behind the two older ponies, and laid the bouquet down on the blanket between them, then disappeared into the night. Stealthy! Yeah! Bolt gently set her hooves back down on the ground and tucked her wings in as she helped Carrot pull himself up. He wasn't very heavy so she had no problem helping him back up to his hooves. After he tripped the whole situation started to seem a little less scary. She wasn't the only one being vulnerable, he was putting himself out there too. Carrot clearly wanted to spend some time with her or else he wouldn't have invited her in the first place. With that thought, among other things, her nervousness started to melt away. As she spoke it sounded a little less awkward then it had before, as if she wasn't grasping at words anymore and instead was just having a normal conversation. "You really think that was cool? that move wasn't a big deal... I kinda just made it up one time while I was flying around with some fillies from school." she laughed "The Wonderbolts? nah I'm not good enough for that stuff! I love seeing them in shows but I could never be one. Besides, I love being a weather pony!" She had a genuine grin on her face now. It was true, she really did love her job, she saw it as being like a Wonderbolt without all of the pressure. The factory work not so much, but the field work, definitely. A pony had to be fast and careful or else they could get hurt, and there were lots of opportunities to be a showoff. Clearing clouds didn't have to be boring like some ponies made it for themselves. Bolt looked up at the constellation Carrot was talking about as he spoke. She listened almost in awe at how much he knew about it, all of the history was so cool. When he finished his story and asked her about her own names and stories she would have normally felt so embarrassed! Especially after the great story he just told, but she didn't feel embarrassed. For some reason she just knew that he wouldn't laugh at her, or tease her for her story even if it wasn't as good as the real ones. She looked around the sky for something familiar and pointed up at a group of celestial bodies that vaguely formed the shape of a lion. She paused to think for a second 'Well I haven't been able to come up with a good name for that one' she gestured again at the stars 'But I like to think that this constellation is a lion that looks out at all the other constellations from on top of a big rock like a real lion does. Since he's the only one I've seen shaped like a lion I like to pretend he's stuck there always looking for another lion to stand in the sky with him, so he's not so alone.' she looked over at Carrot with a goofy smile 'I know that one is really silly, I made it up a long time ago. Do you know the real story? after saying that Bolt looked like she was more than a little excited to hear the real story. The pink filly was so lost in the conversation she didn't even notice the little foal that snuck up right behind her and then stealthily slipped away. It never really clicked in Carrot Field's mind that such moves would be considered rather common to Pegasai - not that it mattered. It was still impressive to him, and her dismissing it as rather easy didn't dampen his awe nor his blush. It was one of those moments he was never going to forget. Noting that she seemed rather proud of telling him she was a weather pony, he became more curious. After all, for him, the weather was always something beyond his control. He wasn't ignorant of the pegasai's command of the weather - but all he knew about it was from reading about it, and he'd never realy heard it from their perspective. It was obvious that this was her calling. "Wot weather creation do ye do, lass? Oi'd wager with those roit quick moves, ye make all sorts of incredible cloud formations. Oi would nae be surprised if ye made th' brilliant lightening as well!" Carrot wasn't sure how pegasai made lightening, actually - if it was some trick or if it just naturally formed when they gathered enough clouds, but if they could make lightning, he was sure she made the best! Of course, he had his own specialty of sorts - well, two specialties - but he doubted she would be interested in hearing about carrot farming! Heck, he wasn't even sure she really had any interest in hearing his knowledge of the constellations, but when she gave a sincere and interested smile he definitely felt more at ease, there was just something about that smile she made ... he sighed happily. As she told her story of a noble lion searching for someone to ease its loneliness, looking up at the asterism of stars Bolt pointed to, he knew she was looking at Ursa Major. It did indeed have the appearance of a great creature looking about, and although it had its own story, he loved her interpretation of it. It was imaginative, and romantic, and it resonated somewhere deep within him. "Well, oi'd nae say that! Oi know that roit o'er there, ye kin see a constellation called Leo th' Lion! He used tae hunt in all th' wild lands of Equestria - he was put among th' stars o'er a thousand years ago tae keep th' ponies safe by havin' him chase th' comets in th' sky instead. Perhaps yer lion need nae be so lonely... she's just nae found th' lion fer her yet. An' if they find each other, they'd nae be so lonely among th' stars!" As he was talking, his head ducked shyly, and he noticed the bundle of flowers by his cart.. How the? Did he bring those? He didn't remember anything of the sort - perhaps his sister had left them in there by accident earlier, and he hadn't noticed them falling out of the blanket when he spread everything out. Well there they were, now. "Maybe it's th' stars way of sayin' there's a pony fer everypony," he said, as he bent down and took the confusing bouquet in his mouth. Oh, pony apples, had he just said something so corny?! He lifted them up to put them away, and found himself staring right into bolt's eyes, the bouquet held out towards her. The shy earth pony froze as he realized what this looked like, his brain running in little panicked circles. Purple Haze's eyes widened with excitement as her big brae offered the flowers to the pretty pegasus filly. She tried really hard not to make any noises, but she wanted to squee and stamp the ground with her front hooves! Instead, she just hunkered down and squirmed eagerly, watching with wide eyes. How exciting! How romantic! How surprising! She didn't expect carrot to pick upt he hint so quickly! Maybe there was some hope for him, yet! Carrot made the mistake of asking Bolt about weather creation, she could talk anypony's ear off for HOURS about weather creation. The filly grinned and started explaining, trying her best to be brief about it "Clouds and storms are actually my specialty! it's why summer is my favorite season, it's when I get to make the best storm clouds! Lightning ... that is kinda tricky, it sort of makes itself. The way that works is when you get your cloud formation just right it starts to make lightning. As long as you take care of your clouds and keep a close eye on them then they'll make lightning for the whole storm with just a little prodding. Maybe I could show you some time!" Bolt wasn't sure how interested Carrot was about the weather so she decided to stop there. The last thing she wanted was to make him bored by going on and on about something he didn't really care about. As Bolt told her story about her lion in the sky, she didn't even think to connect it with what was going on right there in that field. It was only when she was done and Carrot starting talking to her again that she realized she felt a lot like that lion constellation. She smiled as he told her about the other lion in the sky that she had never noticed all these years. "Wow... I guess they don't have to be so lonely..." She said quietly as her voice trailed off. The little pink filly was barely paying attention for a moment because she was just staring at the stars, they really were beautiful. She was so distracted by her own thoughts that she didn't even notice Carrot picking up a pretty bouquet of flowers out of his cart. When Bolt looked back towards Carrot, he had the flowers in his mouth and he was looking right into her eyes. After letting out a little yelp she giggled "Are those for me?! ... so does that mean this really IS a date?" she blurted out. Although Bolt probably wouldn't have said it nearly that straight forward under any other circumstance she was caught off guard because of her day dreaming and those absolutely beautiful flowers! She was embarrassed that she just came out and asked like that and so before Carrot even had a chance to answer she ducked her head a little and blushed bright red. She could feel her cheeks burning and she was so nervous that he was going to say it wasn't really a date. Listening to the cute pink pegasus filly talk about clouds and lightening, Carrot Fields couldn't help but smile. He was genuinely curious, even eager - the part about lightning was interesting to him, to be sure. He'd always wanted to be up there - but what really caught his attention was how her face positively lit up as she enthused over the subject. Sure, she was smiling before, but she became positively exuberant in her joy when she went on about about storms and lightening. There was something especially endearing about that, about the way she was going on. It sure did make his heart skip a beat. "Are those for me?! ... so does that mean this really IS a date?" Carrot froze. He didn't know what to say or do. For the next few seconds - for him, an eternity - a flurry of thoughts flooded his mind. He never planned for this to be a date, as he worried that if he did ask her with such intentions, she would have refused. For Carrot, it was surprising enough she came at all to hang with some dorky farmer pony. She was so cute, she must get the attention of many pegasus stallions. She loved the sky - why anchor herself to someone stuck on the ground? With all of that running through his head, he felt the words swelling up in his throat, his usual response to such a misunderstanding - denial. Of course that never went over well, which only served to reinforce his notion no filly would truly be interested anyway. "Nnnae, umm, nay at first, b-but Oi really would like it tae be! Oye! An' aye, the-these are for ye!" Carrot held them out for her, blushing fiercely. It had been so cool just a minute ago - how was it suddenly so hot, now? Straightforward, honest, that was what he was going with, no self-deprecation, no hesitation. His heart was out there and it was all up to her now. The pause between her question and a response felt like hours, even though it had only been a few seconds. A million thoughts raced through Bolt's head as she waited for Carrot to say something... anything. She felt like she blew it, that he didn't really like her that way and that he must have invited her out as just a friend. Now, because she was so forward, she would scare him away! He was just so sweet and nice, and he seemed like he liked her. At least she thought so, she was never really good at these things.The little filly closed her eyes as she looked away and took a deep breath. Just as she was about to open her mouth and start apologizing, Carrot answered her. Carrot's answer made her a little worried, she thought that maybe he felt pressured by her question. As much as she didn't want to ask out of fear that he'd change his mind, she felt like she had to. "Are... are you sure? I don't want you to feel like it has to be just because I asked... but if you do really want it to be, I really want it to be too.". She made her best effort not to sound shaky or nervous when she said it. Trying to take some of the focus off of that last line, Bolt gently took the flowers from Carrot and put them down so she could get a better look at them. "Wow, these are beautiful..." She spoke quietly and just let her voice trail off as she waited for an answer. "Are ... are you sure?" At first these were the only words that drummed through his mind. Was she offering him an "out" so he could "save face" because she really didn't want this to become a date? Did he really push things too far and misread her true intentions in his enthusiasm? Oh no ... Ach, Carrot Fields, ye've dun it again. If yer shyness dinnae turn the fillies off, seems yer forwardness will. Maybe if he apologized that he hadn't meant to imply anything, she'd feel comfortable enough to not fly off, and he could salvage at least something. "I don't want you to feel like it has to be just because I asked... but if you do really want it to be, I really want it to be too". She was already taking the flowers and commenting on their beauty. The moment was going to pass, his chance was going to pass if he didn't say something right now. Carrot gave a sincere, calm smile, "Aye ... Aye, tis somethin' Oi'd loik very much." Carrot looked down and shuffled his hoof shyly, "Oi was actually ... hopin' it'd turn out tae be so. Oi'm roit glad Oi was nae bein' so silly, after all." Looking back up at her, he blushed some more, "Oi'm glad ye like the flowers, though they're nae so bonnie as ye." Oh Luna, Carrot, that was so dorky! Blushing fiercely and wanting to change the topic from his lame attempt at flirting, Carrot turned back to the telescope. "So, umm ... what other constellations did ye have a name for? Oi'd ken tae it bein' a good number, bein' so high up there in the shy ... I mean sky!" Carrot was feeling extra nervous. It wasn't helping that his stomach started to grumble ... Nuts and shoes, Carrot, ye should've brought snacks for this. Ye dumbtail!" At first Bolt kept her eyes focused on the flowers, making eye contact with Carrot just seemed too scary. The flowers really were nice; Bolt could have sworn that they were picked out and arranged to match her colors but she was probably just thinking too far into it. After all, pinks and purples were the most common colors for flowers, especially in the local area... it must have just been a coincidence. Bolt let out a little sigh of relief and finally looked up at Carrot after he said he did really want this to be a date. She was still feeling a little insecure and worried that she accidentally scared him into this whole situation. The idea that it would have been strange for him to bring her flowers if it wasn't a date was making her feel a little better, and his honest smile sure wasn't hurting either. She continued to blush and smiled back at him when he complimented her. She was about to open her mouth and start apologizing about how nervous she was and how awkward she made that whole situation when she realized he was alright with what happened. Sure, she could have handled the whole thing a lot better but he wasn't mad. He was still just looking at her with the same honest smile as before, maybe even feeling just as nervous as she was. Luckily for Bolt, Carrot turned the subject back to the stars; a much more comfortable topic for both of them. Bolt's blush finally started to fade and she sat back down in the grass next to Carrot. "Well.. names were always the hardest part for me..." she was cut off by the sound of Carrot's stomach grumbling quietly. She looked around for her saddle bags "Oh no! I was totally going to bring snacks but I forgot my saddle bags in my room... sorry." She couldn't believe that she forgot her bags, or that she didn't even notice until just now. Purple Haze grinned eagerly as she watched from the bushes, hidden in the dark shadows as she looked up to the two ponies up on the hillside. "Roit! Good job, Big Brae!" she murmured to herself, full of excitement. She quivered with excitement as they stared into each other's eyes ... then nearly shouted with frustration when they turned away. "Kiss 'er, ye foal!" she restrained herself to whispering. Remembering their sire's favorite exasperated cry, she muttered "Dumbtail!" and muffled a faint little giggle. "Stage two!" she decided, then, as they both turned back to the telescope. Carefully, making as little noise as possible, she snuck up the side of the hill to the blanket her Big Brae had laid out - and carefully, she pulled her lunchbox from her pack, which she'd carefully loaded up with food. The main course was a pair of carrot, lettuce, and tomatoe sandwiches, cut into four little triangles and speared with toothpicks. The side was her favorite - garlic roasted carrot sticks! And she'd made sure to fill the thermos to the brim with her own special drink - a blend of carrot juice, tomatoe juice, and a bunch of other fruits and vegetables, all making a nice, thick, tasty drink. She laid them out carefully, then snuck off again, unable to repress a faint excited giggle that *might* float back on the night breeze to the ears of the stargazing couple, if they weren't too caught up in each other. Carrot Fields felt rather warm and, perhaps, a little bit giddy inside. This whole night actually was working out better than he had expected! All the usual self-depreciative worries and stubborn defeatist assumptions that always made it so hard for him to have any dating success all seemed so silly now. Sure, he was still nervous as heck, and sure, he was still just a little paranoid about saying or doing the "right thing", but this whole night was like a wonderful dream. Heck, even finding those flowers in his cart was a bit of luck! Oi ken Luna does listen when Oi chat tae her at night! He'd never actually met the princess of the night, of course ... and it'd been a long time since he could look up into the night sky and see the Mare in the Moon that had kept him company through the long, lonely nights as a young colt, but he always imagined that somewhere, somehow, she could hear him softly talking to her whenever he stood there, alone in the night, staring up at the moon and pouring out his deepest, most personal concerns. He certainly wasn't alone, now - having Bolt sit comfortably next to him made his heart race. There was just something about her - something that said this could work out somehow, or at least she might say yes to seeing him again. Dinnae get ahead a yeself wit' wild flights of fancy, Carrot. He smiled to the the pink pegasus filly, then looked up to the stars with a thoughtful expression. "Kennin' tae all th' names is roit tricky. They say it was roit hard fer even th' ancient alicorns who created great kingdoms in the sky long before Equestria tae remember every one of that great canopy of stars and comets we see up there - that's why they set up the stars intae th' great beasts and mythical creatures. Oi've been lookin' an' readin' bout them all me life, and Oi often ferget what some are called. But Oi've got some bonnie maps tae use!" It made Bolt feel a lot better knowing that she wasn't the only one who was bad with names, and that even the ancient ponies who came up with the real names for stars didn't always have the easiest time of it. "Even you forget the names of some stars? Well... there are so many to keep track of." She stared up at the sky as Carrot walked away to grab one of his maps. As he was getting up, she thought she heard a noise, it almost sounded like a giggle or somepony whispering. "Did you hear that? I thought I heard somepony giggling... but I thought we were all alone out here." She just as quickly put the noise out of her mind, must have been nothing. Bolt was still a little annoyed that she forgot to bring the snacks, she even remembered exactly where she left them. The bag of hay chips was sitting right next to the tomato and dandelion sandwiches on her countertop back at home. She let out a little sigh as she thought about how forgetful she was tonight. Carrot was trying to be reassuring that forgetting the snacks wasn't a big deal, and he sounded sincere about it so Bolt tried not to beat herself up over the whole thing. However, right in the middle of saying it was his own fault he realized that *he* brought snacks. "Oh! good! you packed something!" she said with a smile. "Now I don't feel nearly as bad for forgetting... but I'll totally remember for next time!" After implying that there was going to be a next time she got quiet... maybe she was assuming too much. Purple Haze's eyes widened as she heard Bolt declare that there would be a next time. Without thinking, she leaped up out of the bush she was hiding in and cried, "AYE!" Then her eyes widened further, her pupils shrinking, and she put her hoof on her own head and slowly pushed herself back down into the bush. Carrot Fields smiled, trying to act as if he'd planned this little dinner all along - he certainly didn't want to ruin the moment. He would have to "thank" Purple Haze later. Hopefully she'd just sat this whole thing up and left ... who was he kidding? She was around somewhere. That concern suddenly came to the fore when Bolt mentioned a "next time." Before Carrot could say anything, a loud, high pitched affirmation came from some nearby bushes. His eyes widened like saucers as his normally gray face turned quite red and his smile became a little fixed. "Aye!! Umm, Oi mean, er ... Oi'd roit love fer there tae be a next time. We could do something ye'd choose, then. Maybe e'en see th' wonderbolts! Oi mean... if'n that's what ye'd like. If ye like Wonderbolts. Oi chose this time, ye should choose next time." Stop babbling, dumbtail! Carrot's eyes darted about for a moment, but he couldn't catch any hint of where Purple may be hiding. It was best not to draw attention to the fact she was out there - he didn't want to derail the date. Wow. A date. Even he, with all his normal self-deprecation, had to admit this was a date. With any luck, Purple would just be watching without doing anything else tonight - though trying to have faith in Purple's ability not to stick her nose in made his stomach drop. But he couldn't let that distract him from the beautiful pink pegasus sitting before him now. "Please, pick what ye'd loik first, and ... " Carrot held up the thermos and gave it a little shake, with a small grin on his face. He knew Purple made *excellent* juice. "Would ye like sommat to drink?" As soon as she mentioned a possible next time, a little foal jumped out of the bush behind Carrot. Bolt reacted as she usually did when something startled her, and without even thinking about it, she was now a few feet in the air. As soon as Bolt realized she jumped up, she was totally embarrassed. It was a nervous habit she'd had ever since she was a foal, and her friends back at flight camp would always pick on her about it. Oddly, Carrot was looking more embarrassed than surprised about somepony yelling, which was making Bolt suspect something was going on. He seemed like he was trying to act like nothing was happening, but he was blushing and kind of rambling. He MUST have heard her, although he couldn't have seen her because his back was facing the bush that the foal popped out of. 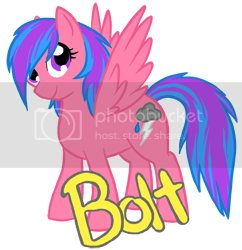 After a few seconds of flight, Bolt blushed and landed back where she was standing. He was still trying to act like it didn't happen, which was really starting to confuse Bolt. Finally, when he asked if she wanted something to drink she couldn't think of anything to say other than "Um.. what ... was that?". Purple Haze let out a sigh of relief, dragging her hoof through her purple-and-orange hair. Her big brae hadn't noticed, and - she froze. Oh NO! The pegasus filly had noticed! Purple Haze froze in terror. What should she say? What should she say?! Everything had been going so perfectly! She didn't want to ruin everything! That's the OPPOSITE of what she wanted to do! Never in Carrot Fields' life had he felt so between a rock and a hard place. Carrot had just arrived tonight hoping to have a bit of fun with a very cute filly, to get to know her a little better, thanks to their mutual interest in the stars. He'd known his little sister, Purple Haze, had been hiding nearby, and had arranged the dinner, and maybe the flowers too. When it'd turned into a date, that hope for romance had brought those stars within reach. He'd honestly hoped, for a few minutes, that tonight would end up being so special. That hope had faded with Bolt's startled response, her question ... and disappeared utterly with Purple's vocal, ridiculous denial. Maybe he should have said something earlier, as soon as he'd realized his sister was out there. Now Bolt was going to think he'd planned it this way - he had to come clean, because Bolt deserved the truth. That was a nice revelation to have, and would be great in any other moment, but now all he could hope for is to not be slapped in the face and be told what a weirdo or creep he was. He sighed, ears down, and softly said, "That ... *sigh* 'Talking' bush is really me baby sis, Purple Haze. She musta followed me from th' farm. An' Oi think she's th' one wot made sure Oi had flowers, an' food... Oi did nae think of it meself. She prolly jes wanted t'help. Oi should ha' told ye right away, but Oi dinnae ... " Carrot let out another melancholy sigh. "dinnae wish tae soil our date ... our time together. Oi'm sorry." Carrot stood up on all fours with a heavy heart. He wanted to just run away, but he had to show some dignity. He turned to the bushes. "Comon out, Purple, nae reason tae keep hidin', now." Bolt walked over to the bush that Haze was hiding in and leaned down to foal level, trying to find her. [colour=#FF40FF]"So you did all of this to make sure your brother had a nice time? "[/colour] Since she was almost positive that Purple Haze thought the night was ruined, Bolt tried to sound as happy about the whole thing as possible. Five minutes ago the night was going beautifully, one little misunderstanding ruining the whole thing would have been pretty silly.